Firefox now has more desktop users than both Microsoft’s web browsers combined—but it’s a rivalry that is increasingly irrelevant as Google Chrome has almost twice the share of Firefox and Microsoft together. The latest figures from Statcounter show that Microsoft Edge and Internet Explorer combined had a 15.5 percent share of worldwide desktop browser usage in April, a decline from 15.8 percent in March. The effect of Microsoft’s new Edge browser is, it seems, marginal, with Windows 10 users apparently preferring other browsers. The boost to Microsoft’s overall browser share that it might have expected from the launch of the Windows 10 with Edge hasn’t happened yet, Statcounter said. Some have blamed Edge’s failure to win users on its limitations: Unlike most other browsers, it won’t run add-ons or plug-ins that can extend functionality. But it may also be a question of inertia: When upgrading to Windows 10 from an older version of the OS, previously installed applications remain in place, meaning users can simply continue with their existing browser and never discover Edge. Firefox’s share was just ahead of Microsoft’s, at 15.6 percent—but only by virtue of having declined more slowly, from 15.7 percent in March. Chrome’s share just keeps on climbing, to 60.5 percent in April from 60.1 percent in March. If current trends continue, then Chrome’s share will be more than double that of Firefox and Microsoft’s browsers combined by June. 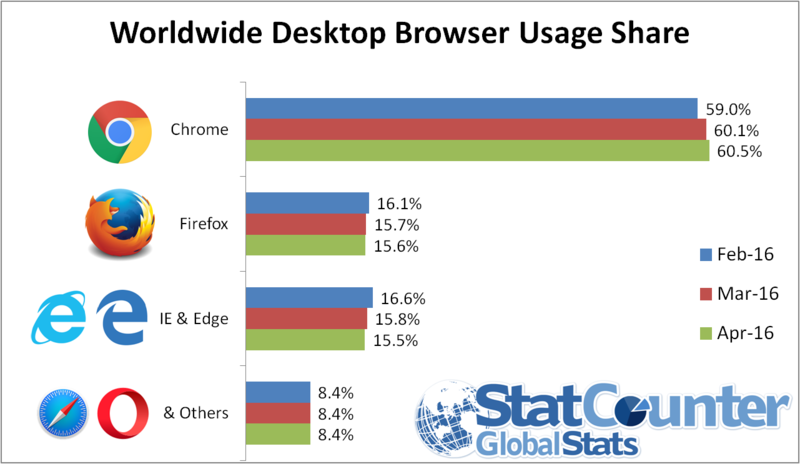 The desktop share of Apple’s browser, Safari, meanwhile, has been unchanged at 4.6 percent for months, according to Statcounter. In the mobile world of phones and tablets it’s a rather different story: Chrome hit a peak of 35.3 percent in January, and has since slipped to 32.5 percent as a new Android browser from Samsung Electronics has eaten into its share. In just three months, the Samsung Internet browser has captured 5.1 percent of the mobile market, more than three times the share of Microsoft’s Internet Explorer Mobile. Safari for iOS, meanwhile, has been hovering around 23 percent for months, while the stock Android browser is in long-term decline, down to 9.1 percent in April from 17.56 percent a year earlier, without a single month of gains, Statcounter figures show. The steadiest climber in the mobile market over the last year has been UC Browser, an Android app developed in China. Its share has risen to 17.8 percent from 11.8 percent a year ago.